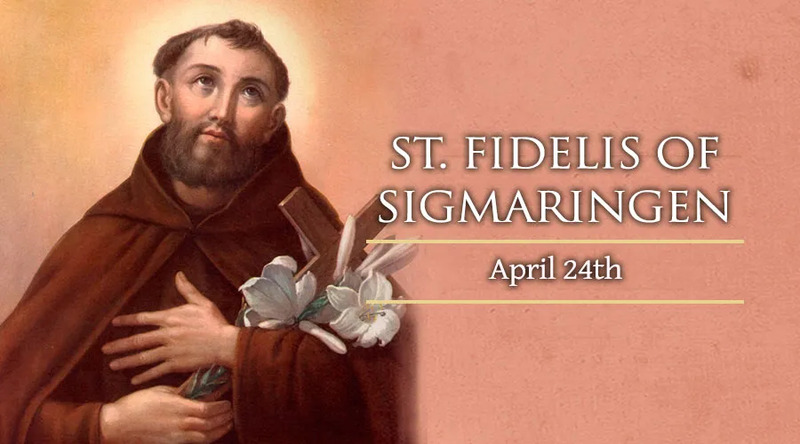 Fidelis' life bridged the sixteenth and seventeenth centuries, a time of religious conflict in Western Europe. He died at the hands of a mob while preaching in Switzerland, where he had gone to combat the Calvinist heresy. With his entry into the order he received the name “Fidelis,” meaning “faithful” -- after the words of Jesus Christ in the Book of Revelation, “Remain faithful until death, and I will give you the crown of life.” As he embraced radical poverty and simplicity, the attorney-turned-Franciscan left his inheritance to a scholarship fund for poor seminarians, who also received his books.